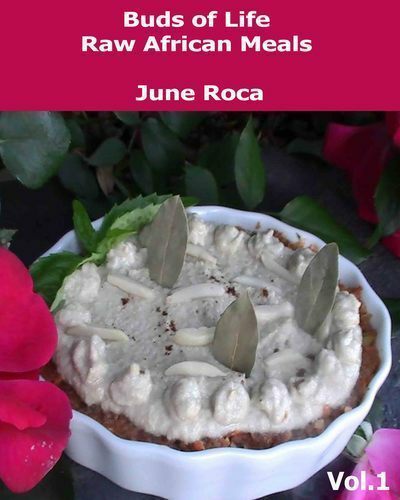 In this book I prepared raw vegetables, fruits, nuts etc. that assist the body. The recipes were made so that one can make a meal for oneself using equipments like a molcajete (a mortar and pestle) that uses no electricity and also use electrical equipments when necessary. This is a raw vegetarian meal (maple syrup, yacon syrup or agave syrup can be substituted for honey to make it a raw vegan meal). This is not a form of diet with restrictions. I am coming from a perspective that is based on commonsense – not restriction, ‘inclusion’ rather than ‘exclusion’ – considering life as all. I also included links for nutritional information that can be useful when looking at how one can eat food that has nutrition that assists the body – so it will not go into starvation mode due to lack of nutrition. The step by step process is also illustrated in pictures – to make sure one can do it with ease – releasing one from doing a lot of work in the kitchen so one can express oneself in all areas of ones life – as life. This product is delivered electronically. There’s no shipping involved. Easily download it immediately after your payment is complete.